Turkey's calculations in Syria are not rocket science. After several months of reluctant negotiations, Turkey has anxiously decided to join the allied battle against the radical Islamists who fight under the flag of the Islamic State of Iraq and Syria (or Islamic State, ISIS, IS). Turkish jets bombed IS strongholds inside Syria, and police detained hundreds of IS supporters operating in Turkey, including two leaders. Moreover, Turkish ministers hastily signed a decree that would allow the U.S. military to use the critical Incirlik air base for strikes against IS targets. Incirlik, in southern Turkey near the Syrian border, is close to many IS strongholds and will cut response times for U.S. aircraft, increasing the efficiency of anti-militant operations. Turkey says that it wants an IS-free zone in northern Syria. But who will fill the vacuum? Turkey says that it, together with the U.S., wants an IS-free zone in northern Syria. That is fine. But who will fill the vacuum in areas cleared of IS? That is an extremely important question Turkey's American allies should think about with extreme care. Turkey simply finds joining the international campaign against IS an opportunity to install pro-Sunni Islamist rule in areas now controlled by IS. We need to support moderate opposition forces there. Moderate opposition forces means all those forces who are tolerant of other Syrian citizens, who do not commit any terrorist crimes and who do not collaborate with the Syrian regime, which is responsible for all these humanitarian tragedies in the last four, five years. The key word here is "moderate." In all reality, Davutoglu wants to replace extreme Islamists with less extreme Islamists. And the less extreme ones come under a different flag: the Free Syrian Army (FSA), which Turkey has vehemently supported over the past few years, in the hope that it would fight and topple Turkey's regional nemesis, Syria's President Bashar al-Assad. Prime Minister Davutoglu wants to replace extreme Islamists with less extreme Islamists. The FSA was formed in August 2011 by Syrian army deserters, and was based in Turkey. Unsurprisingly, its fighters are 90% Sunni, which explains the real appeal to the Sunni supremacist Davutoglu. The FSA militias are a ragtag group of rebels with a cause: to build a Sunni Islamist Syria, albeit not a Salafist Syria. The group does not have a real structure, money or sophisticated weapons to fight either Assad or the Islamic State. In Syria's civil war, it is not uncommon to see fighters moving from one group to another. In March, for instance, the US-backed "moderate" rebel group, Harakat Hazzam, disbanded and its members joined extremist groups such as the al-Nusrah Front (ANF), an al-Qaeda offshoot, and the Levant Front, a coalition of rebels, also with ties to al-Qaeda. The ANF has, in addition, picked up thousands of men who once fought under the flag of the FSA. Almost invariably, the groups fighting in Syria, with varying degrees of violence, are Islamists. If Davutoglu can market the FSA to his American allies, he will be nurturing, on his private agenda, another Islamist group that can potentially become another band of jihadists. Davutoglu is trying to make Syria an extension of Turkey for Muslim Brotherhood Sunni Islam. In 2012, the Human Rights Watch (HRW) issued an open letter to opposition groups in Syria, including the FSA, accusing them of carrying out kidnappings, torture and executions. A United Nations-sponsored inquiry commission documented war crimes committed by these groups. Some FSA-aligned groups have been criticized for having an affiliation with radical Islamists. The FSA itself was accused of summarily executing innumerable prisoners it held. Furthermore, the UN offered credible allegations against opposition groups, including the FSA, that they were recruiting children as soldiers. The FSA was mentioned in a 2014 HRW report detailing the widespread practice of using child soldiers -- just as the IS is doing. All that is reasonable when you recall that some FSA-aligned brigades are working with hardline Islamist groups, including al-Qaeda and Ahrar Al-Sham. Such is the profile of the "moderate" rebel groups that Turkey supports and tells the U.S. are the "good guys" fighting for democracy in Syria. In other words, with U.S. help, Turkey wants to build, in parts of Syria, a Sunni Islamist rule, which it hopes will expand into other Syrian regions, finally reaching Damascus. 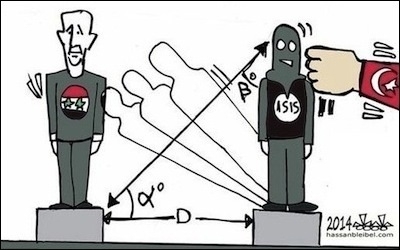 This may not be a realistic scenario, but even its progress can potentially create new Frankenstein monsters in Syria, with, most likely, "moderate" Islamists taking off their masks and becoming the radicals they in fact are.